In the nearly ten years since this site launched, never have we had a post related to the Fab Four (aka The Beatles) or any member of the Liverpool Four. That changes now. In this post, we will look at an early Paul McCartney CD. An early Sir Paul CD with a twist (and shout). The album is the famous songwriter’s 1983 effort, Pipes of Peace. The twist? It is an early Canadian issue. When the CD format launched, Paul McCartney’s Wings and solo catalogs were split between EMI and Columbia Records (part of CBS Records). Looking at the major release regions, EMI covered McCartney’s albums in Japan and Europe, while Columbia had the rights in the U.S. This provides collectors with a variety of early releases on CD to track down. As it turns out, EMI gained the rights to McCartney’s catalogs in the U.S. in the mid-’80s, so the handful of albums released on CD by Columbia (Band on the Run, Venus and Mars, Wings Over America, Tug of War, Pipes of Peace, and Give My Regards to Broad Street) were in print for only a short period and therefore are desirable with collectors. In this post, we will look at an early Columbia release of Pipes of Peace. After reading the first two paragraphs, you might be asking yourself, what do Canadian and U.S. releases of Pipes of Peace have to do with one another? Here is the connection. Back about six years ago, a post was offered on an early Canadian release of Santana Zebop!. You can see that post Just Pills Order Tramadol Online. The disc is actually a Japan-for-U.S. pressing, meaning a Japanese pressing issued in the U.S. The inserts, however, were customized for distribution in Canada. As a result of Canada being a small market compared to the U.S., CBS Records initially distributed Japan-for-U.S. pressings north of the border. U.S. DADC pressings followed in Canada before Canadian pressings took over. Generally speaking, early Canadian releases with Japanese or U.S. DADC pressings are quite rare. 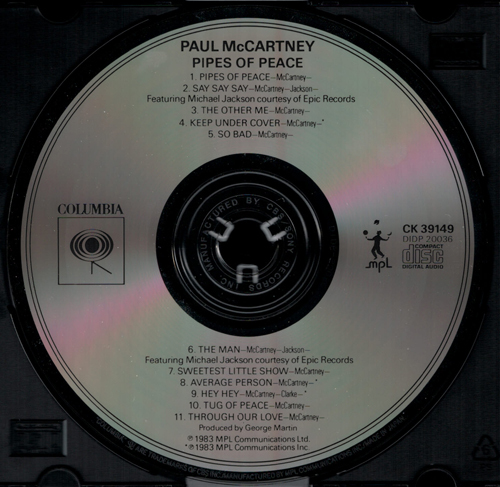 For Pipes of Peace, CBS merely used the U.S. inserts and placed Canadian distribution stickers over the barcode on the back cover of the booklet and the barcode on the back insert. Modifying U.S. inserts in this way was done seemingly only with Japanese pressings and thus represents CBS’s first entry into the Canadian CD market. With CDs being relatively new and with demand being limited, modifying existing U.S. inserts with distribution stickers was expedient. The Japan-for-Canada Columbia issue of Pipes of Peace bears the U.S. catalog number of CK 39149 on the disc and inserts. The inserts state “Record made in Japan by CBS/Sony Records, Tokyo, Japan”. This or similar statements are found on many U.S. CBS titles where the disc was first pressed in Japan. The matrix code on the particular Japanese pressing featured here is “DIDP-20036 21A2”. The disc has “MANUFACTURED BY CBS/SONY RECORDS INC.” stamped on the clear plastic ring and “MADE IN JAPAN” printed along the perimeter. While a standard Japan-for-U.S. Columbia issue of Pipes of Peace is pretty rare, copies with the Canadian distribution stickers are seldom seen on the market. Shown below are the inserts for the rare Japan-for-Canada issue along with the Japanese pressing. In an upcoming post, we will take a look at another early Canadian issue of Pipes of Peace on Columbia. Details of that disc will be contrasted with the release featured here. 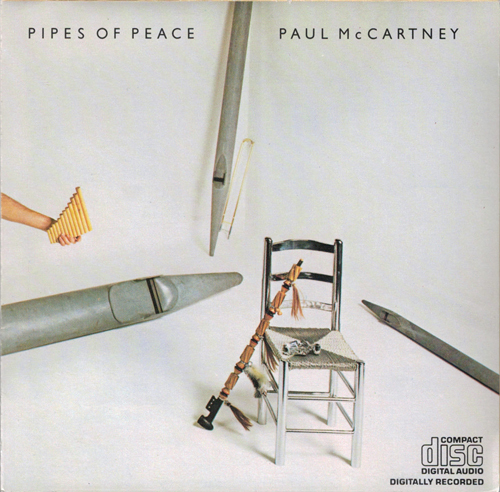 The cover for the Japan-for-Canada issue of Paul McCartney Pipes of Peace (Columbia, catalog number CK 39149). This is the same booklet released in the U.S. by Columbia. Although not shown, the barcode on the back cover of this booklet has been covered with a CBS Records Canada distribution sticker. 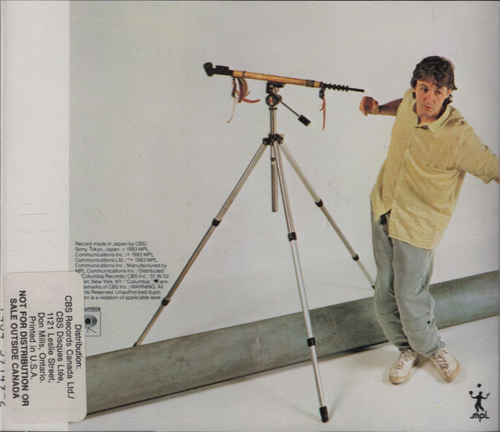 The back insert for the Japan-for-Canada issue of Paul McCartney Pipes of Peace (Columbia, catalog number CK 39149). This is the same back insert found with Japanese pressings issued in the U.S. Note the CBS Records Canada distribution sticker over the barcode in the lower left corner. Looking closely, a portion of the UPC code underneath the distribution sticker is visible along the left edge. The paragraph printed above the Columbia logo begins with “Record made in Japan by CBS/Sony, Tokyo, Japan”. A spine on the back insert for the Japan-for-Canada issue of Paul McCartney Pipes of Peace (Columbia, catalog number CK 39149). The Japan-for-Canada pressing of Paul McCartney Pipes of Peace (Columbia, catalog number CK 39149). This same disc was issued in the U.S. and bears the U.S. catalog number. The disc has “MANUFACTURED BY CBS/SONY RECORD INC.” stamped on the plastic ring, and the matrix code is “DIDP-20036 21A2”. Although difficult to see in this picture, “MADE IN JAPAN” is printed along the perimeter.